Rheumatic mitral valve (MV) disease is still a common problem in developing countries. Despite established techniques of valve repair in the adult population, particularly with non-rheumatic MV disease, valve repair in children with rheumatic mitral regurgitation (MR) is not widely practiced. Considering the disadvantages of prosthetic valve in the pediatric age-group, it is important for surgeons and cardiologists to be aware of the feasibility, techniques and outcomes of MV repair in this subgroup of patients. There are several publications on techniques of repair of MVs for various indications. However, a step-by-step "how to do text" with illustration can only be found in a few publications. This monograph will describe the operation in detail. Almost all cardiac surgery operation theaters are equipped with all the necessary instruments. For children a small Morse-type sternal retractor is required [Figure 1]. 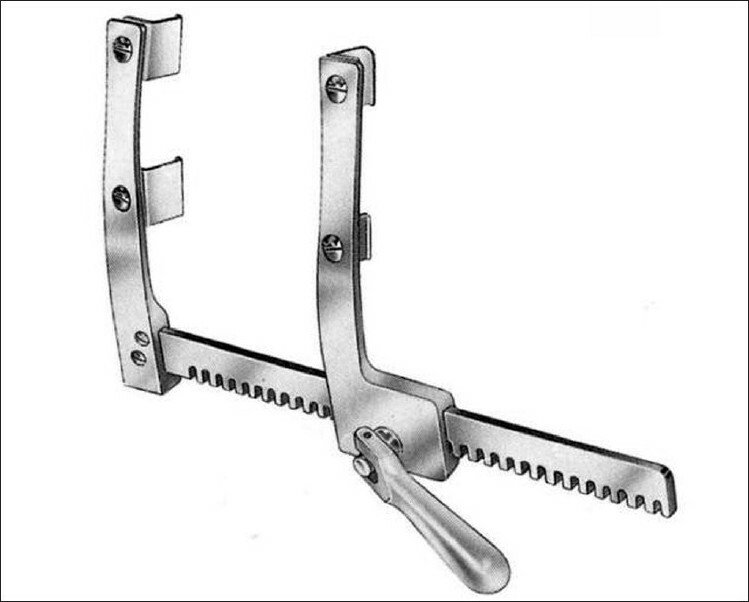 This retractor can be used for sternotomy as well as for right thoracotomy approaches. A pair of valve hooks [Figure 2] and a pair of Russian tissue forceps [Figure 3] are essential instruments. 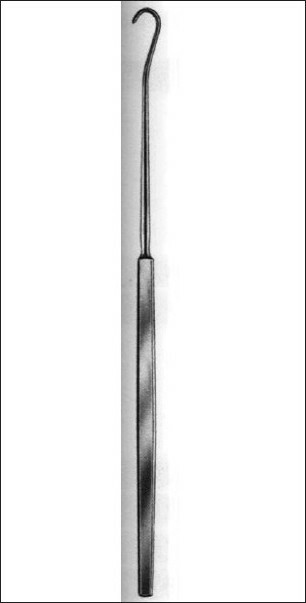 A nerve hook, sizers for mechanical valves and Carpentier's valve sizers are other standard instruments. Carpentier's rings or any other rings of surgeon's choice in all sizes should be available in the operating room (OR). A piece of Teflon felt (hard felt, BARD) can be cut into 'C'-shaped rings of different sizes ranging from 25 to 33 using valve sizers. These may be labeled and packed in plastic containers and sterilized before use. In small children, where a piece of hard felt is not considered desirable because of concerns of growth potential, the biodegradable rings have recently been introduced. But these are very expensive and have not yet been introduced in India. A midsternotomy is the standard approach. The incision is usually small and begins at the sternal angle and stops at the xiphoid. In children with elastic and resilient tissues a full sternotomy can be performed, through this lower midline incision. The sternotomy incision is preferred in children with additional aortic valve pathology as well. For a superior cosmetic result a right thoracotomy is recommended for older children (15 kg or more). An anterior submammary incision is used and the chest is entered through the 4th intercostal space. The right thoracotomy incision is suitable for isolated MV lesions in children, especially girls. Cardiopulmonary bypass (CPB) is established with bicaval and ascending aortic cannulation. Cardioplegia is delivered into the aortic root. The superior vena cava (SVC) and inferior vena cava (IVC) are looped. A vent is placed with its tip in the left inferior pulmonary vein. The vent is passed through the LA incision. Normothermic perfusion with cold-blood cardioplegia (warm body, cold heart) offers the best myocardial protection. Cardioplegia is repeated every 20 minutes and a warm cardioplegia may be infused before releasing aortic clamp. The approach is a standard incision behind the right interatrial groove. The incision can be extended behind the SVC above and upto the IVC right atrial (RA) junction. This approach provides excellent view of the MV when the atrial septum is retracted anteriorly. If there is a need to repair the tricuspid valve then a transeptal approach is preferred. In children with an associated atrial septal defect a RA approach is preferred. The first step on exposing the MV is assessment. The LA cavity and appendage (LAA) are carefully inspected for any thrombus, organized or fresh. Although unusual a thrombus may be present even with sinus rhythm especially when MS is also present. 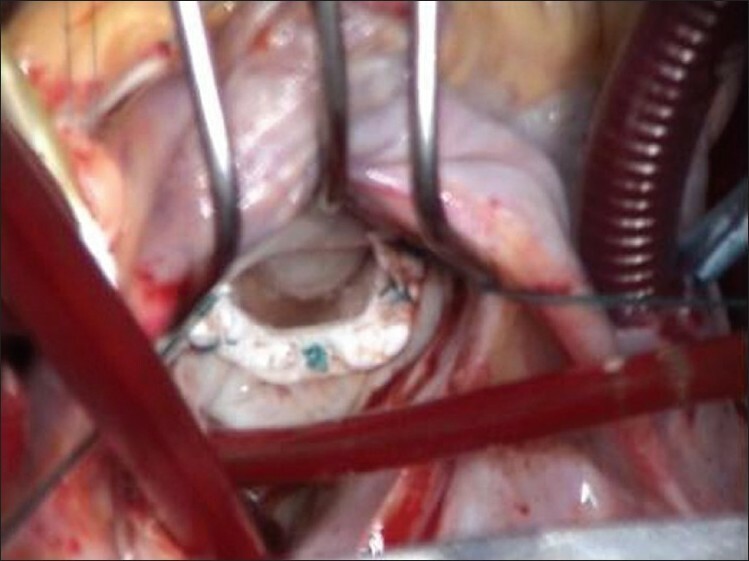 Two valve hooks are passed into the mitral orifice to retract the AML and PML. MS if present is noted as also the thickening of the cusps and commissural fusion. Further assessment is possible after incising the commissures and separating the fusion. Now the hook can be placed around the chordae near the anterolateral commissures, one anteriorly and another posteriorly. Gentle traction exposes the chordae and anterolateral papillary muscle. [Figure 4] Chordae are separated and the papillary muscle is incised with a number 11 blade and an angled Pott's scissors is used to split the papillary muscle all the way down to its base. Care must be exercised to avoid injury to ventricular wall or separation of the papillary muscle. A similar procedure is followed for the posterior commissure as well. In children with no MS the preliminary assessment will include length of chordae, prolapse, ruptured chordae, perforations or vegetations on the cusps, chordae, etc. The ventricular cavity should be inspected carefully for free chordal remnants and vegetations. Prolapse is assessed with the P1 segment as the reference point (rarely prolapsed). Position, number and attachment of elongated/ruptured chordae are carefully noted. In rheumatic heart disease (RHD) fusion of one commissure with prolapse at the other is not unusual. 1. Open commissurotomy as described earlier. 2. Cuspal thinning: Rheumatic valves are usually encased in thick and often fibrotic endocardium. The purpose of this procedure is therefore to gain the width of the cusp and increase its area of coaptation with the other cusp. For this the thickened endocardium at the base of the AML (12 o clock position in surgical view) is grasped with a tissue forceps [Figure 5]. Gentle traction toward the free edge usually peels the thickened AML. This procedure is not required when the AML is thin and transparent. The peel is divided at the free edge with a knife. A similar procedure is performed on the posterior leaflet (PML) as well. Usually thickened mural endocardium (MeCallum's patch) is visible where the regurgitant jet hits the LA wall. This jet lesion is a good indicator of the area of AML prolapse. 3. Chordal shortening at cusp level. , This technique is illustrated in [Figure 6]. It is easy to perform. It can be undone and redone. It provides excellent correction AML prolapse, with good long-term results. This procedure is possible in RHD because the chordae are thickened. The chorda to be shortened is located. A silk thread is looped around both the identified chorda and the corresponding opposite (posterior cusp) chorda. The left ventricle is then filled with saline solution, and the length of chorda to be shortened is determined by assessing the AML's degree of prolapse. A traction suture is placed at the tip of the papillary muscle where the chorda originates. Traction on this suture, and counter-traction on the leading edge of the cusp, provided excellent exposure of the chorda. A 5-0 polypropylene double armed suture is taken and the needle passed through the chorda, and then through the edge of the AML close to its point of attachment. If more than 1 chorda need to be shortened, the other end of the suture is passed through the adjacent chorda in a similar fashion. Both needles are then passed through the thickened edge of the cusp and the suture is tied. 4. Chordal rupture is treated by i) reattachment of chordae ii) excision of ruptured chordae with a triangular resection of AML tip or Quadrangular resection of a PML scallop. The resultant defect is closed by a 5-0 suture. iii) By Chordal transfer. A healthy chorda opposite the ruptured AML chorda is selected. It is separated with a small quadrangle of PML and is sutured to the appropriate site in the AML free edge using 6-0 sutures. The defect in the PML is closed by a horizontal mattress suture of 5-0 monofilament. The transferred chordae must be selected from the same papillary muscle as the ruptured chordae. Before performing annuloplasty, the left ventricle is filled by cold saline with a bulb syringe. This step will show any free or ruptured chordae and residual areas of prolapse. An annuloplasty is necessary to remodel and reduce the dilated MV annulus. There are several techniques. In principle the procedure reduces and pushes the posterior 2/3 rd of the mitral annulus and increases the coaptation of the free edges of AML and PML. Double-armed horizontal mattress sutures are placed 2 mm behind the annulus all round the MV. Alternate white and green sutures provide clarity. The two commissural sutures are identified and held on hemostats. An appropriate-sized Carpentier mitral sizer is used to match the AML by aligning the commissural sutures against the sizer. The correct size ring is now obtained. The two commissural sutures are placed at the markers on the ring. The remaining sutures are passed through the appropriate site on the ring. When all sutures have been taken through the ring it is lowered and the sutures tied. The valve is now tested by injecting saline into the LV. Gentle pressure on the left ventricle from the surface can easily demonstrate competence of the valve. If satisfactory the LA incision can be closed [Figure 7]. A Teflon felt C-shaped ring prepared on the table or precut and sterlized or a Cosgrove ring may also be used for annuloplasty. For this nine sutures, (5 green and 4) white are required. The first suture is placed in the left fibrous trigone. This is a somewhat pale or white dimple and can be identified by traction on the AML free edge. It is usually at or about the 11 o clock position. The second suture is placed in the right fibrous trigone identified similarly by a dimple. It is at or about the 1 o clock position. 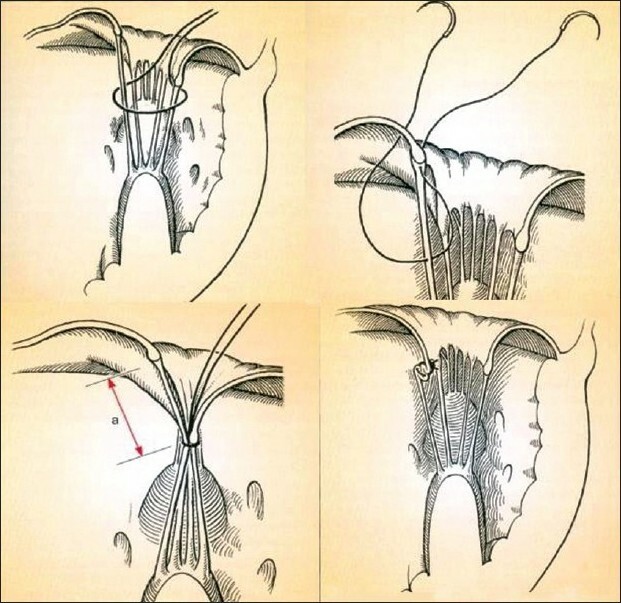 It is important that the first two sutures are placed accurately in the left and right fibrous triagones as this is a common error that results in failure of the repair. The third suture is placed exactly halfway from the first and second suture and is placed about the 6 o clock position. It is placed 2-3 mm behind the mitral annulus. The fourth and fifth sutures are placed midway between suture 1 and 3 and suture 2 and 3, again 2-3 mm behind the annulus. The four white sutures pickup the LA wall between the green sutures. The ring size is selected by sizing the AML. With two hooks traction is placed on the AML chordae. The AML can now be measured using the standard sizers used for mechanical valves. The correct size ring is obtained and clipped to the drape on the surgeon's side with a hemostat. The first suture is passed at the left free end of the ring. The second suture is passed through the right free end of the ring. The third suture is passed in the center of the ring. The remaining sutures are appropriately positioned on the ring in the same sequence as they were placed on the LA wall. The ring is now lowered into the LA and the sutures are tied. The competence of the MV is tested by injecting saline into the LV. In RHD thickening and retraction of the PML may produce acquired clefts between P1-P2 and P2-P3. In such cases the coaptation is deficient at such sites. A simple horizontal mattress suture of 5-0 monofilament is enough to close such acquired clefts and improve coaptation. If the repair is satisfactory and there are no visible leaks, one can proceed to complete the operation. If the repair is satisfactory, its appearance when the LV is filled with saline is akin to a "smile" which we refer to as the "Mitral Smile". The interior of the left atrium is thoroughly washed. The LA vent is removed. The ventline is now connected to the aortic root vent (Cardioplegia Cannula). A 28 or 32F chest drain tube is placed through the MV into the LV. The last sidehole should be located in the LA. The atriotomy incision is now closed with 3-0 monofilament using two sutures which begin at either end of the incision. The suture is interrupted around the tube and held on a hemostat. 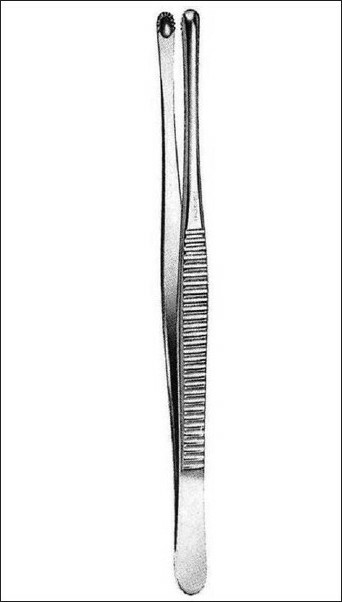 A tissue forceps is inserted into the LA sutureline to keep it open. The headend is lowered. Aortic crossclamp is removed while pinching the right coronary ostium. The aortic vent is placed on negative suction at 300 ml/min. The heart resumes beating. The anesthesiologist is asked to manually ventilate the patient. If the pleura is opened then a waste suction is applied and all fluid and collected blood is aspirated. The surgeon uses his right hand to deair the cardiac chambers. The thumb massages the right pulmonary veins. The index finger inverts the LAA and massages the left pulmonary veins. The three other fingers gently massage the LV. All this is done while the manual ventilation is being done. A level of blood is maintained in the pericardial cavity well above the LA suture line. The venous return line is partially clamped. The patient's chest and the retractor are held by the surgeon and vigorously shook. While holding the breath in inspiration the chest tube and tissue forceps are removed from the LA sutureline, ensuring a blood level above this. The two sutures are pulled taut and tied. The lungs are deflated and all pericardial blood is aspirated with the cardiotomy suckers. The aortic vent is still on 300-ml negative suction. The clamp on the venous line is removed. The LA suture-line is now completed in the second layer. With the heart empty the LAA is clamped with a partial clamp and ligated at its base. In the right thoracotomy incision the LAA can be drawn up behind the aorta in the transverse sinus and ligated. synchronized shock may be given to convert to sinus rhythm. Otherwise pacing wires/atrial/ventricular are placed and the heart is paced with an external pacemaker. The IVC cannula is clamped while observing the heart. There should be some ejections. The aortic vent continues to be on 300 ml / min negative suction. The IVC cannula is removed and the site oversewn. While observing the heartbeat, rhythm and pressures the venous line is partially clamped. When all is satisfactory (arterial pressure of at least 70 mmHg, normal sinus rhythm or ventricular pacing, no distension of the heart and pulmonary artery) the SVC cannula is clamped and CPB discontinued. The arterial perfusion line is inspected for any air bubbles as some may start showing up. The aortic vent remains on negative suction at 300 ml/min for at least 5 minutes after discontinuing CPB. An arterial pressure of 70 mm or more is accepted. No inotropic support is started. The surgeon continues to observe the heart. MV function-residual stenosis, regurgitant jets, coaptation length and any prolapse. Using color Doppler MS is assessesd and any MR is quantified. No more than trivial to mild MR may be accepted [Figure 8]. Tricuspid and aortic valve function. If all is satisfactory the SVC cannula can be removed and RA appendage ligated with a silk thread. Additional atrial pacing wire may be placed for atrial pacing. Two to three cardioversion shocks (10-30 J) may be used with the synchronizer to convert to NSR and capture on atrial pacing if required. The aortic vent line is removed when there is no residual air on TEE. The arterial pressure dramatically improves with this step. Inotropic support is rarely required and should be used judiciously. All cardiac suture sites are inspected and if satisfactory, heparin is reversed. The aortic cannula is removed after reinfusing all blood from the oxygenator. The cannulation sites are reinforced. 1. 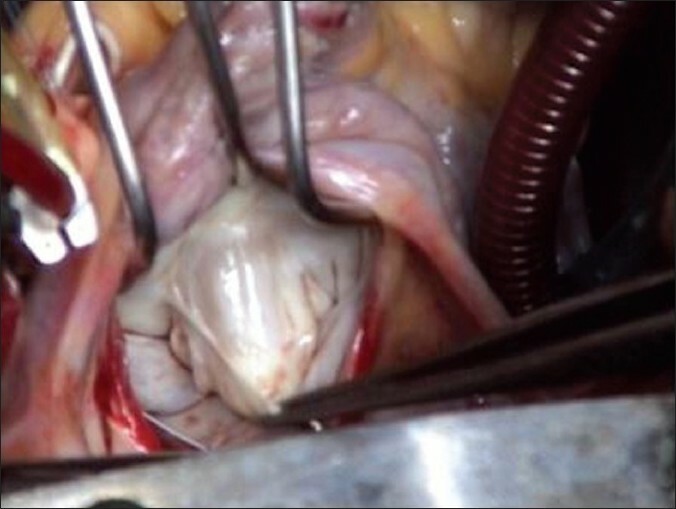 Kumar AS, Saxena A. Intraoperative transoesophageal echocardiography (ITEE) in mitral valve Surgery. Ind J Thorac Cardiovasc Surg 2009;25:107-11. 2. Gupta A, GhardeP, Kumar AS. Anterior Mitral Leaflet Length: Predictor for Mitral Valve Repair in a Rheumatic Population. Ann Thorac Surg 2010;90:1930-3. 3. Kirkpatrick JN, Lang RM. Surgical Echocardiography of Heart Valves; A Primer for the Cardiovascular surgeon. Semin Thorac Cardiovasc Surg 2010;22:200-15. 4. Choudhary SK, Dhareshwar J, Govil A, Airan B, Kumar AS. Open mitral commissurotomy in the current era: Indications, technique, and results. Ann Thorac Surg 2003;75:41-6. 5. Kumar AS, Rao PN. Restoration of Pliability to Mitral leaflets during reconstruction. J Heart Valve Dis 1995;4:251-3. 6. Kumar AS, Bhan A, Kumar RV, Shrivastava S, Sood AK, Gopinath N. Cusp-Level Chordal Shortening for Rheumatic Mitral Regurgitation. Tex Heart Inst J 1992;19:47-50. 7. Murala JS, Kumar AS. Long -term results of cusp level chordal shortening for Anterior Mitral Leaflet prolapse. Tex Heart Inst J 2004;31:246-50. 8. 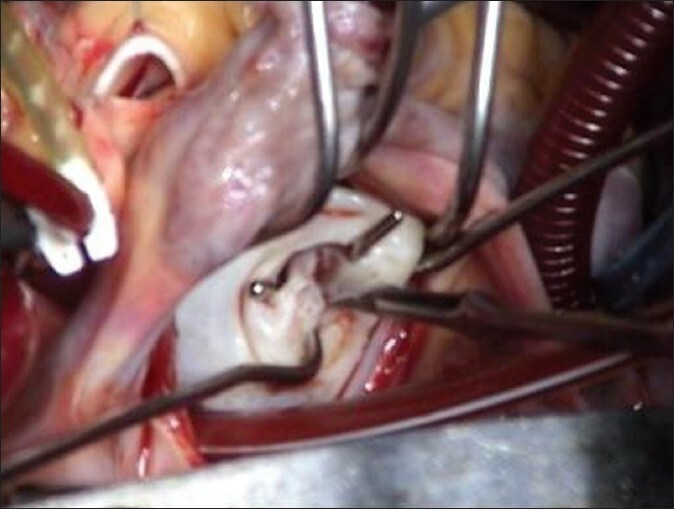 8 Kumar AS, Kumar RV, Shrivastava S, Venugopal P, Sood AK, Gopinath N. Mitral Valve Reconstruction: Early results of a Modified Cooley Technique. Tex Heart Inst J 1992;19:107-11. 9. Kumar AS, Rao PN, Saxena A. Mitral valve Reconstruction: Eight years experience in 531 patients. J Heart Valve Dis 1997;6:591-3. 10. Choudhary SK, Talwar S, Dubey B, Chopra A, Saxena A, Kumar AS. Mitral valve repair in a predominantly rheumatic population: Long term results. Tex Heart Inst J 2001;28:8-15. 11. Talwar S, Rajesh MR, Subramanian A, Saxena A, Kumar AS. Mitral valve repair in children with rheumatic heart disease. J Thorac Cardiovasc Surg 2005;129:875-9.